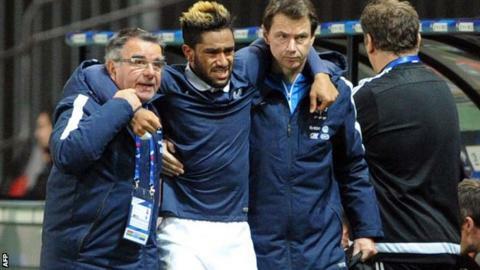 Aston Villa full-back Jordan Amavi will miss the remainder of the season with a cruciate knee ligament injury. Amavi joined Villa from Nice in July for an undisclosed fee and has made 12 appearances this season. Villa said: "Everyone at the club wishes Jordan a speedy recovery and we look forward to seeing him back on a football pitch as soon as possible." Villa are bottom of the Premier League but drew with leaders Manchester City in their first match under new manager Remi Garde, keeping their first clean sheet since the opening day of the season. Their next match is against Everton, at Goodison Park on Saturday.